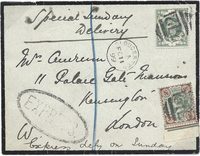 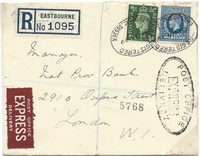 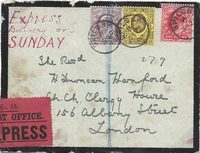 1939 REGISTERED EXPRESS Envelope addressed to London franked by a George V 10d, SG 448 and a George VI ½d, SG 462, tied by Registered Eastbourne, Sussex oval datestamps. 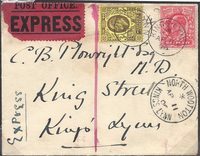 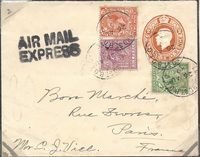 1920 "AIRMAIL EXPRESS" 2d ORANGE STATIONERY ENVELOPE TO PARIS franked by a ½d, SG 315, a 2d, SG 368 and a 6d, SG 385, tied by "LOMBARD ST B O B C circular datestamps - EXPRESS FEE 6d, POSTAGE 2½d, AIRMAIL 2d. 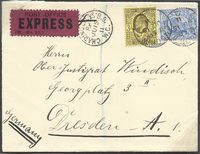 Very Attractive.